Timber Frame Construction: What’s wrong in the UK? I spotted this article in Building Magazine about insurers threatening to pull cover for timber frame buildings.This, combined with highly publicized recent fires in London on building sites in Camberwell and Peckham. While investigations are ongoing, the whole thing seems a bit strange to me. 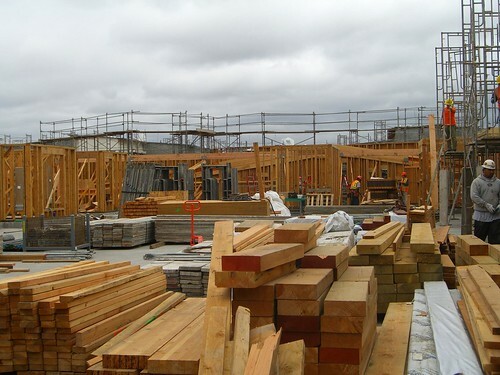 Nearly all non-high rise apartment buildings in California are timber frame, due to the high seismic performance, low cost and environmental benefits of this form of construction. At the job I worked at prior to moving to London, I was did construction administration on a site composed of 15 timber-framed buildings in Oakland, California. Despite the its location in a statistically high-crime, urban area, nobody considered building in timber a high-risk proposition. Why is there paranoia about fire on construction sites in the UK, whereas it is not a problem in California? I have a feeling it is because large construction sites in urban areas in California have security on the job site 24 hours a day. It is very common for large buildings to be constructed on tight urban sites up to five stories tall entirely out of timber. While arson may be more common in the UK, it seems that with proper alarm systems and supervision it is entirely possible to prevent these sort of incidents from happening. 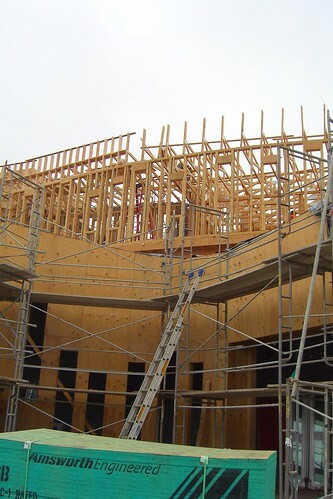 The benefits of timber construction seem too great to rule out the method due to poor implementation so far.The biggest part of the problem seems to be that timber is unfamiliar to many contractors, and proper precautions are not taken because the disconnect between timber frame contractors and the general contractor (on many jobs in the US, the lead contractor is responsible for the timber frame). Hopefully, many of these problems can be worked out. Interest in this type of construction in the UK is high in light of the desire to reduce CO2 in construction- it seemed that innovative methods of timber construction were everywhere at last week’s Ecobuild conference here in London. and I guess traditions as well, I’m Swedish and it’s only recently we’ve once again allowed apartment buildings to be made with timber frames. up until recently it was really only one-family houses that were legally permitted to have them, which is a rest from the many fires in Swedish cities up until the 20th century. so even though timber frames are ubiquitous when it comes to smaller buildings we still have fairly few examples of bigger schemes where timber frames are used. Er, either p is having a laugh or he’s being stupid with that historical reference. He probably has a point on the tradition side of things though. not really having a laugh, the fire will obviously have been a important influence in the forming of a tradition, don’t you reckon? not having any idea about the regulations regarding timber construction in the UK I know that the reason we (in a country mostly consisting of forests and thus with an abundance of raw material) allowed it was some EU regulation which would have been very recently, I can imagine it’s the same over there? Tradition is shaped by experience, but there have been massive city-destroying fires in the US too- The Great Chicago Fire of 1871 and San Francisco’s earthquake and fire of 1906 immediately come to mind. I don’t know the history of the building regulations in the UK, having previously lived in the Unites States. With modern methods of construction, it is possible (and fairly easy) to prevent the spread of fires in timber buildings. As an example, I was working as the architect for Habitat for Humanity in California and one of their building sites was set on fire by an arsonist. While only partially built, the properly detailed party wall prevented the fire from spreading beyond the first unit: http://www.flickr.com/photos/markhogan/3573695277/in/photostream/. The main risk seems to be during construction. Once complete, when all the fireproofing layers of plasterboard have been installed, fire is not that much more of a risk in a modern timber building than in a masonry one- especially if a sprinkler system has been fitted (which is true in nearly every US timber frame apartment building). oh, I know modern constructions can withstand fire. I’m in no way negative towards timber-frame buildings, I was merely trying to think of reasons why there might be few buildings made of timber in the UK. very hypothetically, I know, as I’ve never lived in Britain nor know enough about its regulations. but for someone from a country where we’ve been known to make timber-stud walls with brick rain screens (less maintanance, see; the 70’s were great) and still have very few larger timber buildings -apart from glu-lam halls- I assumed something similar might be the case over there. let’s just hope more timber buildings will be built in the future. Oh. You just can not imagine how tough rules limit the wood construction in Russia.